SRIT is the RESOURCE CENTRE for Spoken Tutorial Project of IIT Bombay under the National Mission on Education through Information and Communication Technology (NMEICT), funded by Ministry of Human Resource and Development (MHRD), Government of India. 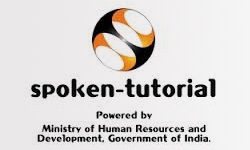 The Spoken Tutorial project is the initiative of the ‘Talk to a Teacher’ activity of the National Mission on Education through Information and Communication Technology (NMEICT), launched by the Ministry of Human Resources and Development, Government of India. 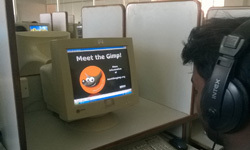 The spoken Tutorial Project aims to make spoken tutorials on Free and Open Source Software (FOSS) available in several Indian languages, for the learner to be able to learn in the language he/she is comfortable in. This project is for the community and by the community. A spoken tutorial is an audio-video tutorial that explains an activity performed on the computer. An expert explains the working of software, by demonstrating it on the screen, along with a running commentary. Screencast software makes a movie of the entire activity, both the screen and the spoken part. This movie is the spoken tutorial. The running commentary can be in English or in any other language. Spoken tutorial is a recording of an actual session. As a result, it can capture every step that is required to explain an activity. This completeness combined with an accompanying audio-video tutorial makes the spoken tutorial the best way to document and to explain software or a computer based activity. Creating a document in any other way is inefficient. A ten minute video, for example, can have about 100 screen transitions. Imagine the work involved in taking screen shots and using them to create a pdf document.